Maths anxiety symptoms can appear before children even start school! Some children find learning to count numbers a struggle so when they start school their attitude towards math is already one of anxiety. “Help - I can’t cope with more issues! !” I hear you cry. Don’t panic we are here to help and make some suggestions for solutions below. Now breath it’s going to be ok. THE BIG QUESTION OF WHAT CAUSES MATH ANXIETY STILL HASN’T BEEN SOLVED BY RESEARCHERS OR SCIENTISTS. Are children bad at maths because they feel anxious about the subject? Do children have math anxiety because they find processing maths ideas hard? The answer is probably a combination of factors depending on the student and their brain development or what’s happening at home and in school life. However what research has been able to prove that if students write down their math fears or do breathing exercises before an exam their scores improve. Which is fantastic news as this demonstrates you CAN do something about math anxiety and it doesn’t need to be a lifelong affliction — more on the writing technique below. We suggest playing games to calm children/teenagers through these anxieties, try websites like Table Fables which uses poop and farts to make children laugh and learn. Anything that makes children laugh is brilliant. You can’t feel anxious if you are laughing. If your child is showing signs of math anxiety or struggling with math the sooner you address the issues the faster the problem can be sorted out. If you had problems with your heart you wouldn’t say “Doctor, it’s ok I’ll fix my heart issues in 5 years, I can live with the heart palpitations and panic for another few years!!”. Don’t let your child self-esteem and confidence suffer if they have problems sort them out sooner rather than later. Now I must take my advice and fix the hole in the fence! Do you remember ever feeling stressed or anxious when a math teacher asked you a question? What about math homework when nothing made sense? Being extremely nervous when faced with doing basic mathematics isn’t a great feeling but can be overcome with patience and time. You are also NOT alone. Many people fear math and any situation where math is required. Scientist and educators until recently thought that math anxieties first appeared when children begin to learn complex math such as algebra. However new studies have established that children as young as 6 or younger can feel anxious and have negative feelings towards math. Researchers found that almost half of the children who participated in the study said that they were at least somewhat nervous about doing math. Also, children with higher math anxiety got worse scores on the math test. Researchers concluded that the relationship between math anxiety and math ability develops when children are very young. But what are the causes of Math Anxiety??? Those who start school struggling with numbers are more likely to develop math anxiety. This idea hasn’t been tested yet but feedback from parents of children with Dyscalculia or Number Dyslexia would suggest that those who develop maths anxiety did struggle learning to count pre-school. Maths anxiety develops in children who are exposed to social situations that affect their thoughts and feeling towards maths. Eg children normally pick up negative thoughts and feelings from parent, teachers or other individuals in their lives. Studies have shown that teachers with high maths anxiety have students with poorer math achievement at the end of the school year. Unsurprisingly suggesting that the way the teachers act when delivering maths lessons affects their pupils. What exactly happens in the brain when people experience math anxiety? 1. The brain has to remember the numbers. 2. Work out what steps are needed to solve the problem. 3. Say or write the answer down - ALL AT THE SAME TIME. Researcher have a theory that when people experience anxious feelings this uses massive amounts of their WORKING MEMORY so they don’t have enough space to process the maths problem. The theory being that if students weren’t so anxious then they would have more space in their Working Memory to solve the math problem. In other words their maths anxiety is causing them to repeatedly fail. This theory has been supported by various studies. Studies have also demonstrated that children’s brains scanned in an MRI machine while completing math tasks, showed that children with high math anxiety over used an area of the brain called the amygdala, rather than those children who didn’t have maths anxiety. Also those children that suffer from high math anxiety underuse two areas in their brains that deal with Working Memory and Mathematical processing compared to those children that don’t have math anxiety. Leading researchers to believe that those students with math anxiety are massively over using an area of the brain that deals with anxiety while under using the areas of the brain designed to help work out mathematical procedures. The ultimate goal is for students to never develop math anxieties in the first place. Sites like Table Fables will help children regain confidence or not develop any issues, sites like Table Fables use humour and animation to make children laugh while they are learning maths. When a child is laughing and having fun they can’t feel anxious. Research has shown that writing down thoughts and feeling, which would normally clog up Working Memory or mathematical procedure areas of the brain with anxiety, has proven to help students that suffer from maths anxiety feel calmer before tests. And guess what when they are calmer they score HIGHER on their tests. So make sure you or your child ALWAYS writes down their thoughts and feelings before an exam or before math lessons. The act of writing down anxieties lets students see that a lot of their worries are unfounded and frees up the brain to concentrate on the math. A. Get them to write down as many of their fears as possible eg “I’m scared of failing.”, “This is too hard for me” etc. B. Now take a moment to carefully consider a rational response to each thought based on evidence from you past. Eg “I’ve passed exams before, I can do it again.”, “Some of questions might be hard but I will know the answers to lots of questions.” etc. A different group of researchers showed that if college students with math anxiety did breathing exercises before tests to calm them down then scores on their test improved. These studies proved that with intervention math anxieties can be controlled - which is very reassuring as it means that math anxieties don’t need to be a lifelong affliction. However it would be better for children not to develop any math anxieties in the first instance. We have discovered that playing board or card games and using websites like Table Fables massively help children laugh and have fun with math rather than feeling stressed and anxious. 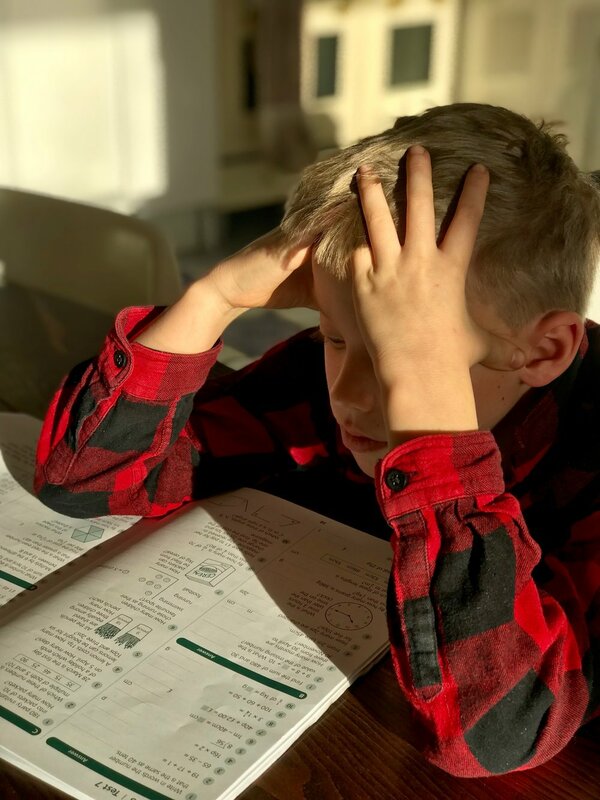 Math anxieties challenges those who suffer from it in classes, careers and everyday lives and can greatly affect those who suffer from math anxieties as they progress through life. Research has shown that math anxiety starts early and is affected by social situation as well as brain activity. However calming exercises can be used to make sure the correct areas of the brain are functioning properly rather than hindering the mathematical process. More research is needed into why only some people suffer from math anxiety and not others. Until more is understood, most researchers believe that talking to fellow students, parents, teachers and colleagues about your emotional response to math is the first step to reducing the harmful effects of math anxiety.